Years and years ago, I knit N a hat. Plain old stockinette in plain old black Aurora Bulky. He wore it all the time. Then he lost it, we found it, we washed it again, it shrunk a little (so much for superwash). 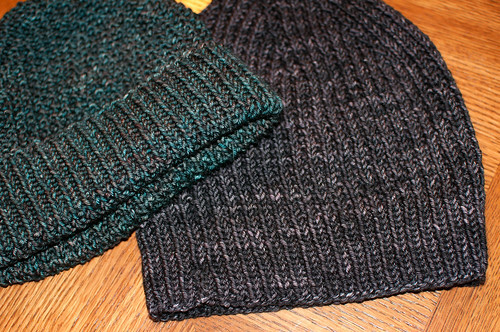 So I knit him a second hat in Manos (Lava) — black with red and yellow. But he never really wore that hat. Later he said it was too scratchy and not black enough. A month or so ago, N asked for a new hat. Black, easy care, not too rough. I decided that Madelinetosh Tosh Vintage would be a good yarn for the not-rough, easy care part. But when I went looking for a black yarn in Tosh Vintage, I had trouble finding one. Red toned, blue toned, brown toned, green toned. I finally ordered Georgia O’Keeffe, which looked very black to me, with teal bits. I knit Graham, a free pattern [ravelry]. I like it. I handed it to N.
Ooooook. He also had some changes to make to the size of the hat. 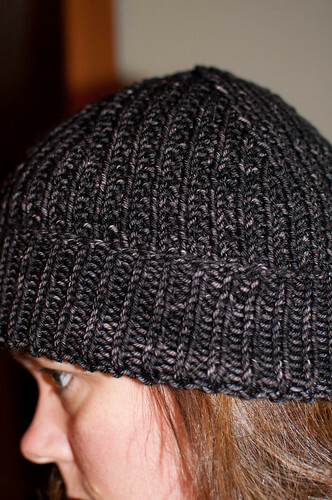 He wanted the ribbing to be 1/2″ shorter and the part of the hat before the crown also 1/2″ shorter. Easy enough. He did agree that the yarn was soft enough, so at least I had that working for me. So I ordered some more Tosh Vintage, this time in the now-discontinued Cloak. A very plain plain black. Almost black. Mostly black. 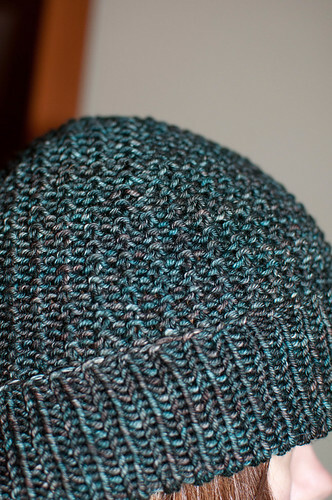 I knit another Graham, this time only knitting the ribbing to 2.5″ and starting the crown decreases at 7″. This one has been stamped approved, though I believe it is a little short. N prefers his hat inside out. Graham is a great hat and works up quickly. Knit one! I might knit a third.